Figure A. FITC conjugated Mouse anti Bovine CD4 Antibody (MCA1653F) and RPE conjugated Mouse IgG3 isotype control (MCA5920PE). Figure B. FITC conjugated Mouse anti Bovine CD4 Antibody (MCA1653F) and RPE conjugated Mouse anti Bovine CD45RO Antibody (MCA2434PE). All experiments performed on red cell lysed bovine blood gated on lymphoid cells in the presence of 10% rat serum. Data acquired on the ZE5™ Cell Analyzer. Figure A. RPE-Cy5 conjugated Mouse anti Bovine CD172a Antibody (MCA2041C) and RPE conjugated Mouse IgG3 isotype control (MCA5920PE). 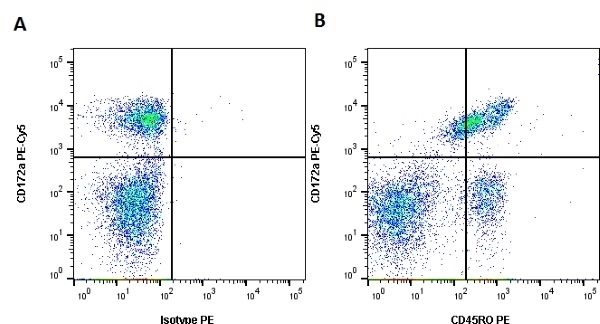 Figure B. RPE-Cy5 conjugated Mouse anti Bovine CD172a Antibody (MCA2041C) and RPE conjugated Mouse anti Bovine CD45RO Antibody (MCA2434PE). All experiments performed on red cell lysed bovine blood gated on lymphoid cells in the presence of 10% rat serum. Data acquired on the ZE5™ Cell Analyzer. Figure A. FITC conjugated Mouse anti Bovine WC1 Antibody (MCA838F) and RPE conjugated Mouse IgG3 isotype control (MCA5920PE). Figure B. FITC conjugated Mouse anti Bovine WC1 Antibody (MCA838F) and RPE conjugated Mouse anti Bovine CD45RO Antibody (MCA2434PE). All experiments performed on red cell lysed bovine blood gated on lymphoid cells in the presence of 10% rat serum. Data acquired on the ZE5™ Cell Analyzer. Figure A. RPE-Cy5 conjugated Mouse anti Bovine CD172a Antibody (MCA2041C) and RPE conjugated Mouse IgG3 isotype control (MCA5920PE). 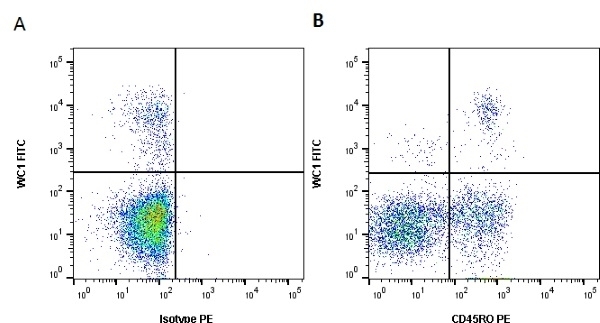 Figure B. RPE-Cy5 conjugated Mouse anti Bovine CD172a Antibody (MCA2041C) and Mouse anti Bovine CD45RO Antibody (MCA2434GA) conjugated with Human anti Mouse IgG3:RPE Antibody (HCA039PE). All experiments performed on red cell lysed bovine blood gated on lymphoid cells in the presence of 10% rat serum. Data acquired on the ZE5™ Cell Analyzer. Mouse anti Bovine CD45RO, clone IL-A116 recognises the bovine homologue of the human CD45RO cell surface antigen. CD45, also known as Leucocyte Common Antigen or LCA, occurs in a number of isoforms, clone IL-A116 is specific for the low molecular weight isoform termed CD45RO, the isoform associated with expression on memory T-cells. Bovine CD45RO is expressed by monocytes, granulocytes and subsets of thymocytes, CD4+ T cells and CD8+ T cells. Studies utilizing clone IL-A116 have demonstrated that the percentage of CD45RO+ CD8+ T cells increase from approximately 5% in neonatal calves to approximately 35% in adult cattle over the age of 5 years (Hogg et al. 2011). It has been demonstrated that mouse anti bovine CD45RO, clone IL-A116 immunoprecipitates a molecule of ~180 kDa (Bembridge et al. 1995) which is analogus to the molecular weight of human and mouse CD45RO. 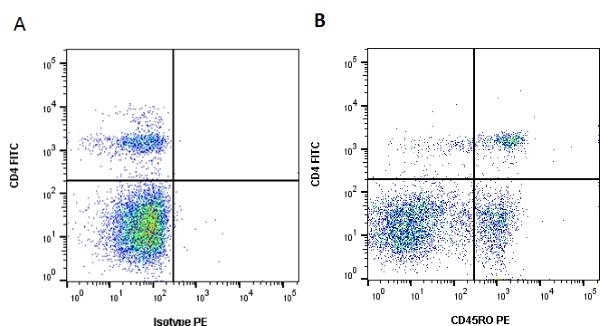 Mouse anti Bovine CD45RO, clone IL-A116 has been demonstrated to recognise the CD45RO cell surface antigen by flow cytometry in both European cattle, Bos taurus, and in Zebu, B.indicus (Bembridge et al. 1995). Bovine peripheral blood monouclear cells. Spleen cells from immunised BALB/c mice were fused with cells of the X63.Ag8.653 myeloma cell line. Hogg, A.E. et al. (2011) Characterization of age-related changes in bovine CD8+ T-cells. Vet Immunol Immunopathol. 140 (1-2): 47-54. Whelan, A.O. et al. 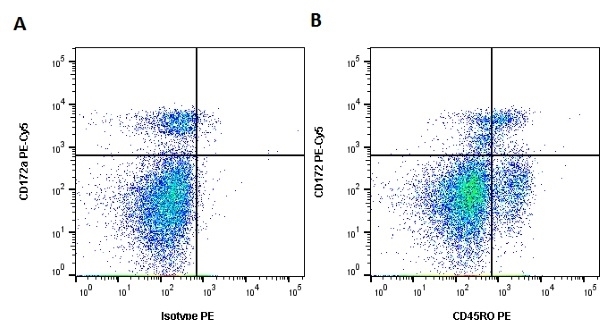 (2011) Development of an antibody to bovine IL-2 reveals multifunctional CD4 T(EM) cells in cattle naturally infected with bovine tuberculosis. PLoS One. 6 (12): e29194. Sopp, P. & Howard, C.J. (2001) IFN gamma and IL-4 production by CD4, CD8 and WC1 gamma delta TCR(+) T cells from cattle lymph nodes and blood. Vet Immunol Immunopathol. 81 (1-2): 85-96. Mcinnes, E. et al. (1999) Phenotypic analysis of local cellular responses in calves infected with bovine respiratory syncytial virus. Bembridge, G.P. et al. (1993) Comparison of monoclonal antibodies with potential specificity for restricted isoforms of the leukocyte common antigen (CD45R). Vet Immunol Immunopathol. 39 (1-3): 129-36.